Renova is one tretinoin-containing cream product used for the management of mild to moderate acne in patients and is also indicated for a couple of other skin conditions like wrinkles, skin spots, and rough skin. According to some sources, this drug has been discontinued by its manufacturer, OrthoNeutrogena, but creams similar to the product are still available in the market. Renova Cream: What is this Product? Renova cream is a topical agent containing the active ingredient tretinoin. It is available in different strengths, 0.02%, and 0.05%, although other brands contain further varieties of the product. According to online information for Renova, it is an expensive medication less popular than most of its brand and generic counterparts. Apart from being expensive, Renova is also not covered by most insurance and medicare policies, hence the huge price burden imposed upon buyers. There is no definite reason for the discontinuation of this product, but consumers needing this type of tretinoin cream are given a plethora of other options for treatment, given the number of generic alternatives for this product. The price information above suggests that Renova 0.02% topical cream costs $283.37 for 40 grams of Renova, but the cream can cost as much as $315.07 depending on the total grams of cream bought. Although there is price information for Renova from reliable platforms like Drugs.com, customers planning on purchasing Renova at local pharmacies should anticipate its loss due to the news of its discontinuation. Buyers should not grieve over the loss of this drug, though, since there are viable generic alternatives for the product, which, in fact, are cheaper than the Renova cream. Aside from Drugs.com, there are other platforms like Good Rx that are able to present prices for Renova alternatives, like Refissa. 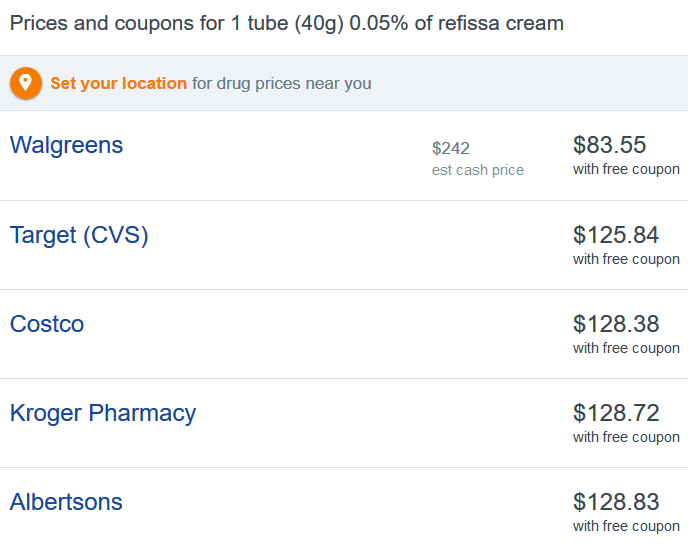 According to the Good Rx price info for Refissa (containing 0.05% Tretinoin) 20g, customers can purchase the product for at least $46.47 from local US drugstores like Walgreens, Kroger Pharmacy, Costco, Albertsons, Safeway, and plenty others; however, in some cases, you may need to use special coupons for the special prices. For another generic tretinoin 0.05% product (40g tube), according to Good Rx, consumers can purchase one tube for at least $59.96 to $192 depending on the local drugstore buyers will be purchasing the cream from. However, the low prices for this generic tretinoin product are only achieved using special coupons from Good Rx. For instance, the regular price for the same product at Walgreens is actually $192—the roughly $60 price for the same tube is attainable only through the help of a special discount coupon. 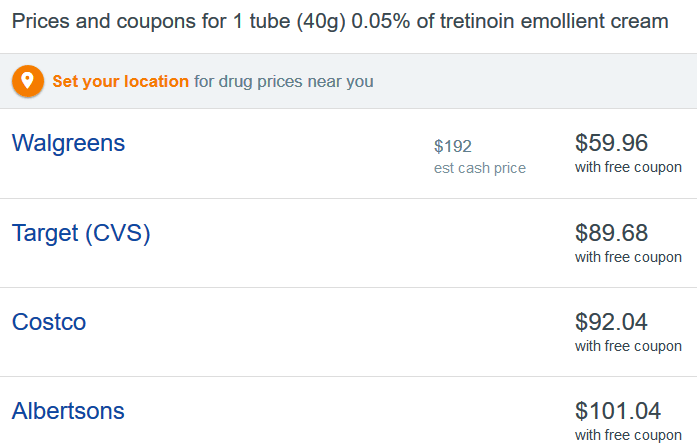 The same tretinoin 0.05% 40g cream from Retissa, on the other hand, has a price ranging from $83.55 to $242 (or even higher) depending on the local pharmacy. 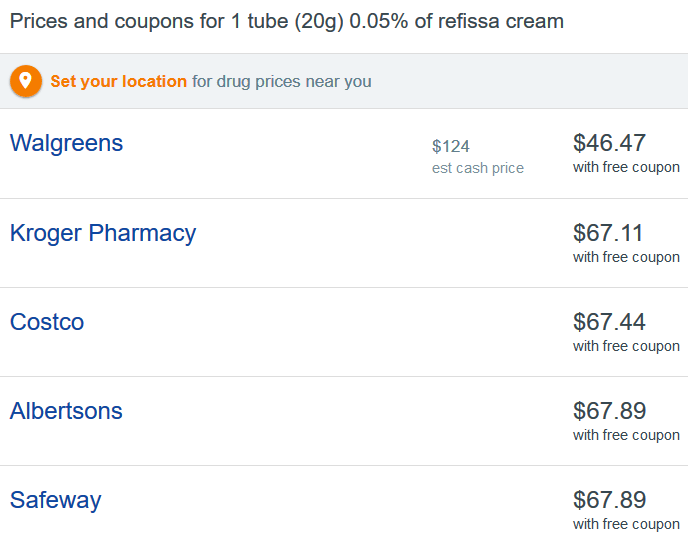 Again, the special price for the Retissa tretinoin tube is only due to the Good Rx coupon price. Good Rx provides coupons specific to local drugstores, so customers can only use these coupons at designated local pharmacies. Good Rx also has a price list for generic tretinoin 60g containing 0.05% tretinoin. It is cheaper than the 40g Retissa, though, possibly because of its generic nature. 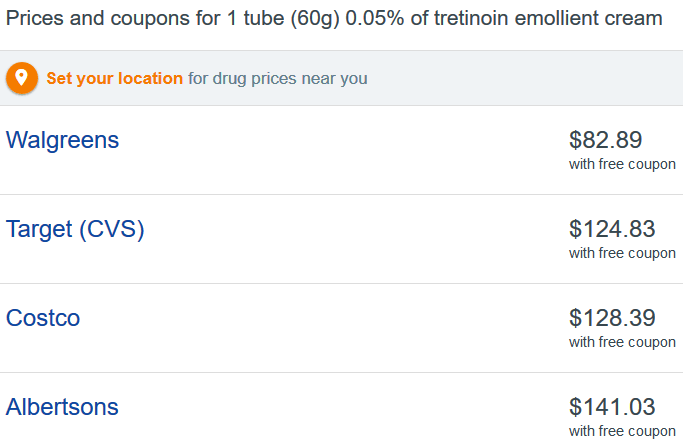 According to Good Rx, local US pharmacies sell this 60g tretinoin cream tube for at least $82.89. Good Rx is one of the platforms that declared Renova as discontinued. However, the site provided customers with coupons for Renova’s generic alternatives, like this discount card for US Costco stores. According to Good Rx, buyers may print this coupon and present it to the store so they can avail of the special price for the treatment. Other online platforms are also with Renova discount coupons and according to one from Internet Drug Coupons, buyers can save 20 to 75% of Renova cost when they present this online coupon. Like Good Rx’s coupon, customers can just print this and present the coupon to the participating local pharmacies. 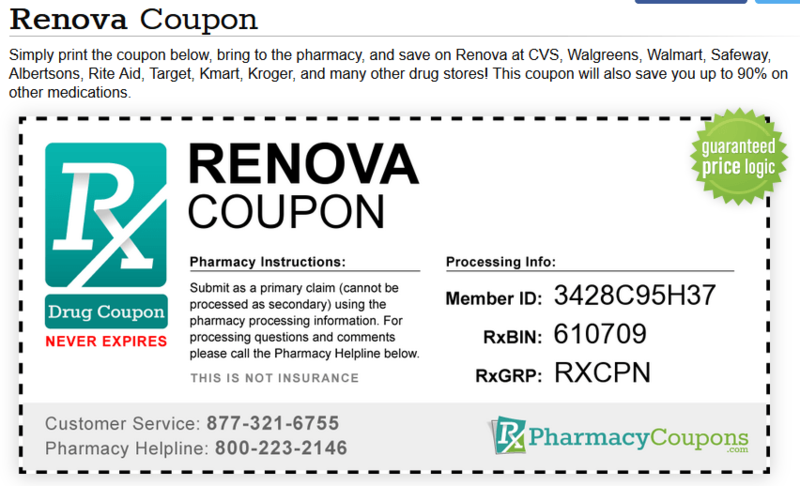 Another site, Rx Pharmacy Coupons, is offering a printable Renova discount coupon usable at various US local drugstores like Albertsons, Walmart, Safeway, Target, Rite Aid, CVS, Walgreens, and plenty other drugstores. 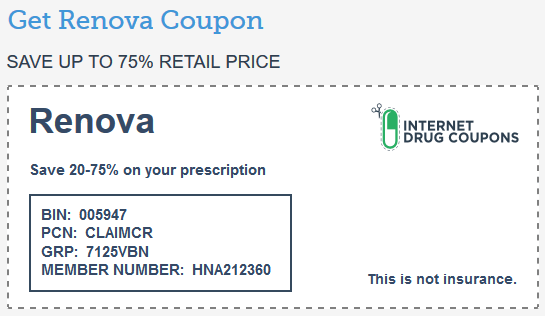 Apart from Renova, though, this coupon is also applicable to other medications and will never expire. 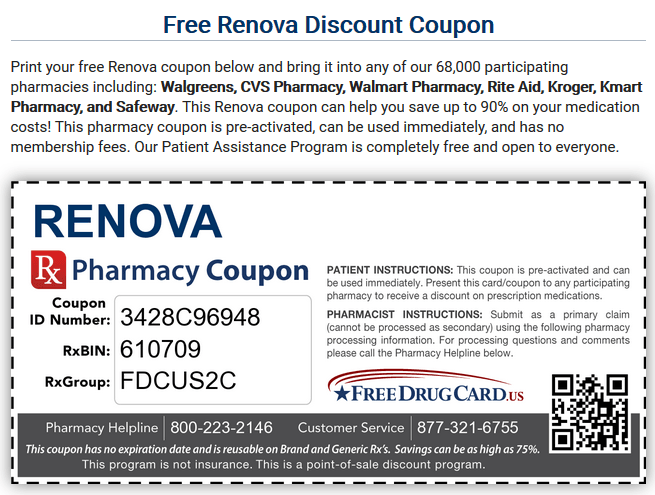 According to Free Drug Card, its coupon for Renova can help slash 75% off Renova price, although the website did not say exactly how much are the customers going to save. Buyers can use this coupon at 68,000 participating local pharmacies. This coupon has no expiry date and may be reused. Renova is a prescription product for mild skin conditions like mild acne, wrinkles, and others. According to Good Rx, the product has been discontinued by its manufacturer, so we are anticipating the dwindling sales of this product at local pharmacies. Despite its status, buyers can still purchase Renova from drugstores and may still use the coupons to save in cost, considering Renova’s expensive price. Buyers, though, may opt for generic substitutes for Renova found at local drugstores, or on web pharmacies included on our list of TOP Pharmacy Vendors of the year.